Please enjoy the easy and exciting performance that the GXL Wireless Series provides for your next performance. CAD Audio has been creating valued product since 1938 and prides itself on developing and supporting the live performer. Our design criterion was straightforward. Develop a high value wireless microphone system that can cope with today’s challenging RF environment that is both easy to use and exciting to operate. The GXL-V Wireless includes the following features: Two discrete channels of wireless packaged in one receiver chassis. Each channel has RF and AF indicator lights that indicate the presence of connectivity and audio source. VHF Frequency Operation for increased operating range Advanced dipole antenna technology for increased operating range. Three output options on the receiver for maximum performance and flexibility of use two Professional balanced discrete XLR Professional 1/4 inch summed output for easy output to a guitar amp or mixer equipped with 1/4 inch input connections. Handheld transmitter outfitted with on/off and mute function for flexibility of use. Battery life of >10hrs. Handheld transmitter features battery life indicator. All Body pack systems ship with WXGTR guitar cable and WXHW condenser head worn mic included in the system. Enjoy the easy and exciting performance that the GXL Wireless Series provides for your next stage performance. CAD Audio has been creating valued product since 1933 and prides itself on developing and supporting the live performer. The design criterion for the GXL-V wireless mic series was straightforward: Develop a high value wireless microphone system that can cope with today's challenging RF environment, that is both easy to use and exciting to operate. The GXL-V Wireless series comes in multiple configurations for your live performance needs, with high-quality, reliable components to keep up with you for the long haul. Features of the GXL-V series include two discrete channels of wireless packaged in one receiver chassis, with a compact, discrete VHF antenna that recesses when not in use. Each channel has RF and AF indicator lights that indicate the presence of connectivity and audio source. Three output options are available on the receiver for maximum performance and flexibility of use. Choose from a professional balanced XLR discrete, professional balanced XLR mixed output, or a professional 1/4 inch output for easy output to a guitar amp or mixer equipped with 1/4 inch input connections. 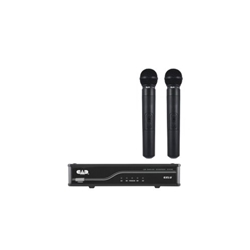 Wireless components in the GXL-V series feature advanced battery life, with the ability of delivering over 10 hours of performance for the mics and transmitters. Each handheld transmitter is outfitted with mute and on positions for flexibility of use. The handheld transmitters also feature a battery life indicator, so you know how much stage time you have left.